WHAT:A Collaborative liturgy where Worship is Service and Service is Worship. A blessing of the bikes will also be offered. WHAT DO I NEED TO BRING? 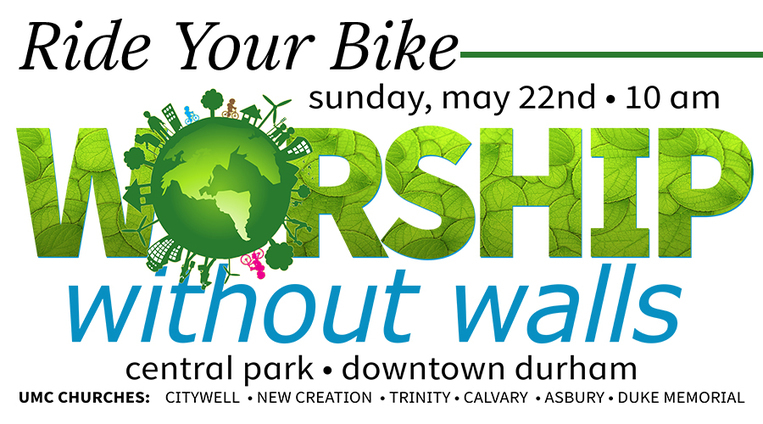 A bike (if you choose to bike to worship), lawn chair or blanket, sunglasses and *sunscreen, $5.00 per person for lunch provided by Camp Chestnut Ridge. *We will worship under the awning. Plenty of shade will be provided! WHAT IS GOING TO HAPPEN? We’ll gather at 10:00 for a vibrant worship including guest musicians, a community choir, and Holy Communion. In celebration of Creation Care, a bike parade will follow a special blessing of the bikes. At 11:00, our worship will continue as we offer ourselves and our gifts to the Durham community through a variety of service projects including picking up litter and bagging sweet potatoes. Lunch will be served by Camp Chestnut Ridge around 12 noon. Stay as long as you like to enjoy the fellowship. ​Come and eat we will have FOOD FOR ALL - this 100% Locally Sourced Meal will include BLTs, Reubens-vegetarian style, Sweet Potato Salad, homemade Potato Chips, PB&Js, and more all for a suggested Donation of $5/person. Gluten Free, Vegan and Nut-free options available too! Come and picnic together with us as we celebrate the delicious bounty of God's Creation. From Worship Service to Serving Together! Join us in engaging in these projects of service after the service! Help us fight hunger with Society of St. Andrew's! We can use hundreds of people to package 12,000+ pounds of donated potatoes that will be distributed to soup kitchens food pantries, and low income housing areas. Help pick up litter and trash from creeks and trails with Keep Durham Beautiful! We can use 30-40 people for this project and everything you'll need (gloves, bags, etc.) will be provided! Make it easy- ride your bike! Street parking available along Foster Street, Hunt Street, Rigsbee Street, Roney Street and Corporation. There are also two lots—one on Foster Street next to the YMCA and one behind the Farmer’s Market pavilion. You can also park at The Durham Centre Deck at 300 Morgan Street which is two blocks away.